Station Master does a whole bunch of things to inform, educate and help you around all of London's stations on the Tube, Overground and DLR. There are already a few Apps out there which will tell you which carriage to be in to be nearer the exit. 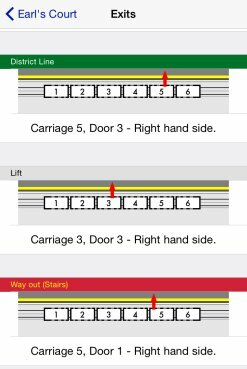 But Station Master is the only App that tells you which carriage and which exact door to be at (and on which side of the train) so that you are lined up perfectly with where you want to go - it's the most used feature of the App. Select a line, station and then the direction of where you are getting off of your train, and it will tell you which carriage and door position to be in to be nearest the exit. e.g In four taps of the screen (Line, Station, Exit, Direction) you can find out where the best position to be is to exit the train. Here you can see if for the Piccadilly Line, travelling eastbound at Earl's Court. Be in the fifth carriage, third door down - or the third carriage, third door down if you want the lift instead. There are also many points on the system where the official ‘Way Out’ signs actually take you a longer way round than necessary, or if it's quicker to nip down another passageway. So we've made a note of all the cross-passages and alternative exits/way out from every station where it's quicker. 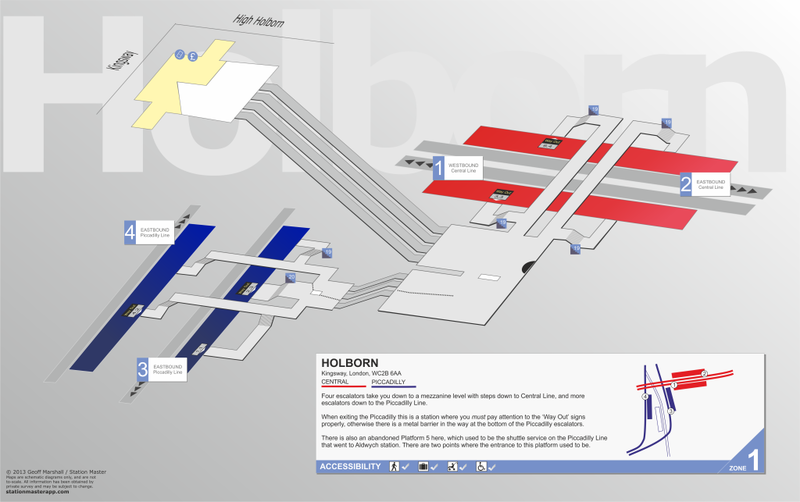 We've drawn 3D maps of Tube, Overground and DLR station - which you can zoom in on and see the exact layout of complicated stations. 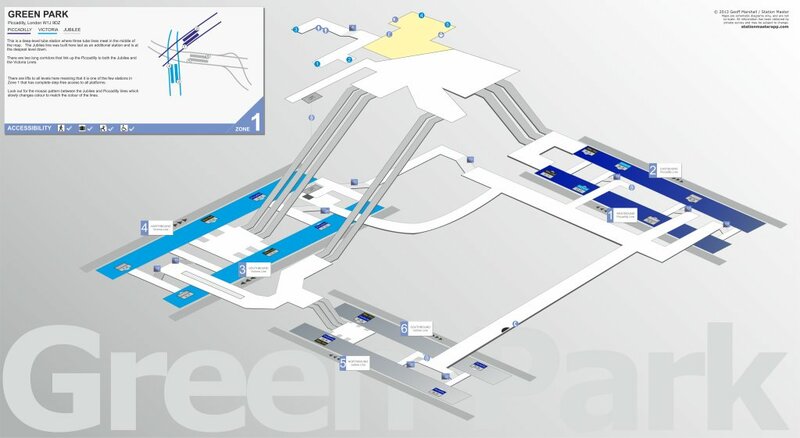 See where the corridor sections are, where the passageways twist and turn, where the escalators are and how many steps there are on the staircases. You can learn the station layout and perhaps work out a quicker, more sneaky way to go! Go to the 3D Maps page for more. 3D Maps show here are of a lower resolutions, and fixed in size. Within the App they are hi-resolution, scroll able and zoom able allowing you to look at any part of the station. Go to the 3D Maps page for more. Some places have multiple 'subway' exits after you exit the gateline. 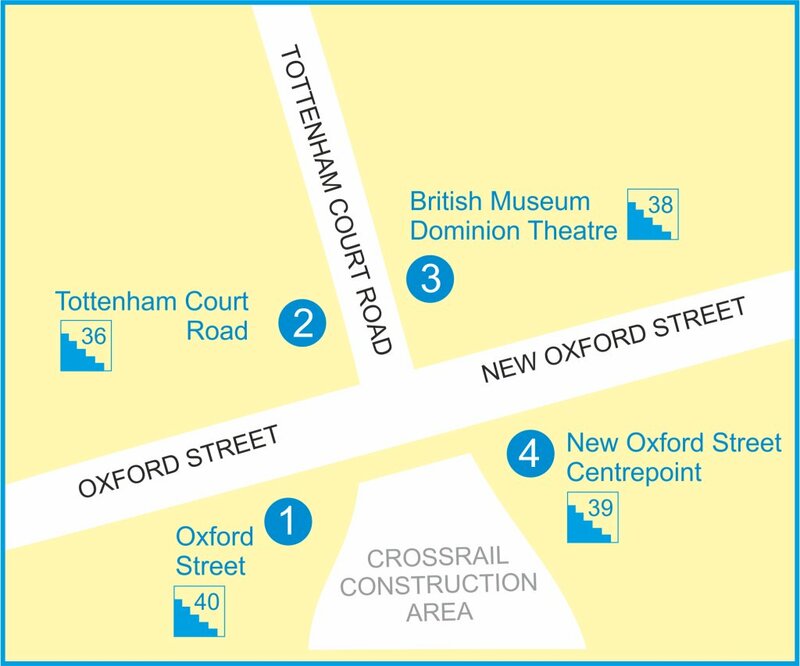 Gants Hill, Hanger Lane, Old Street and Notting Hill Tube stations for example have different ways out to the street - we've got a map for all these stations showing you which is the best place to exit. You can look this up whilst travelling on the train to your destination so you'll know before you get there where to go. 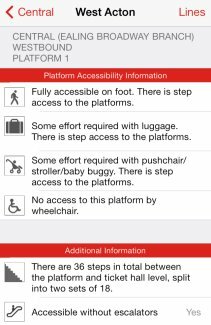 It also shows you how many steps there are, if accessibility is an issue for you. 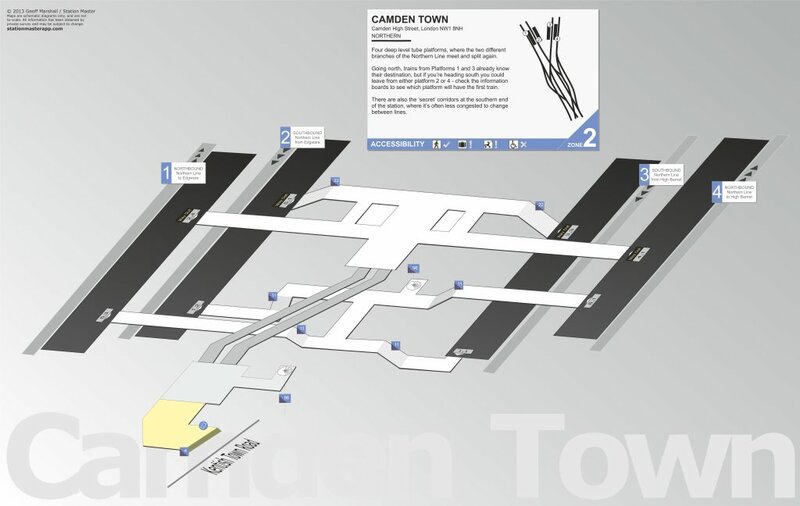 TfL do provide two guides - one is the Step Free Tube guide, and another is the Avoiding Stairs Tube guide - which are great - except that their definition of 'Step Free' refers to wheelchairs users only - which is flawed, because if you have luggage or push chair, a station that has escalator access to platform level (e.g. Walthamstow) is easy for you to use. Station Master then shows the accessibility options for every platform at your chosen station. We know people that can manage a small number of steps (up to 10), but no more. There are those who can walk down stairs, but not up them. Some people can only manage steps if there is a rail to hold on to - i.e. Accessibility can vary upon your own personal needs, so Station Master presents you with the facts at that station and let's you make your own decisions. 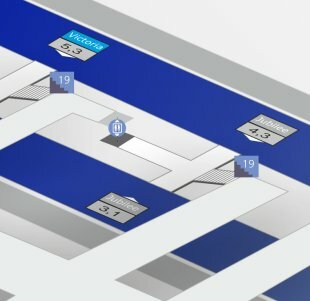 So we've included the numbers of steps on each staircase on the 3D maps, so you can see at a glance just how 'step free' a station really is. TfL provide gap/step information at station where there is step-free access to the station, but there isn't always level access from the platform to the train. Where they provide these measurements though, they don't say if it's a step-up or step-down from the platform to the train, so we've been out and personally measured them for ourselves, and is the only App that that tells you if it's up or down - wheelchair users find this really useful as they can manage a step down but not a step up when boarding or exiting a train. Some people don’t like going on escalators – and there are many stations which are accessible only by escalator – we’ll tell you which ones. Or perhaps you’re claustrophobic and don’t like going in crowded lifts, Station Master tells you which stations have lifts – and how many steps there are on the ‘emergency’ staircases for those who don’t want to ride in the lift. We've even made a note of what type of barriers/gates are at each station (not all stations have wide access or wheelchair accessible gatelines) so you know what to expect at each station. To summarise - - we’ve collected all the information of every station for you and put it into the App. From the detailed breakdown of all the choices available to you, you can work out for your own needs if a station is really accessible to you or not. It’s hard to know if a station is going to have mobile phone signal or not because whilst some are clearly down in the depths of the Tube, and others are way above ground, there are many that fall into a grey area where it’s not so obvious. There are even stations where as you're passing through on a train being at one end of the train will not give you a signal, whilst being at the other end will – we’ll tell you where that is. There are also some stations that in 2012 had Wi-Fi rolled out to them, and was expanded in 2013. This means you can get online whilst waiting for a train - and the App will tell you which ones. We’ve made an exact note of what shops (e.g. Newsagents, Dry Cleaners, Minicab firms etc.. ) and facilities (e.g. Cash Machines, Payphones etc.. ) that are at each station. Does that outdoor station have a waiting room (with a heater for the winter), or just a waiting shelter? Although TfL have this information on their Getting Around section on their website - a lot of it missing - and in some cases is incorrect or out of date. So we physically went to every station to look for ourselves, and made a note of the correct information - and we will keep checking this information to make sure it's current. There are toilets at some underground stations, but which ones? Do you have to pay for them, and if so how much? Are they accessible to all, and are there baby-changing facilities there too? Also (more importantly) are they inside or outside the gate line if they’re in the ticket office area, or are they on the platform? Although there is the official Toilet Tube Map, it doesn’t give all of these specifics, but Station Master does, as we went to and checked out every toilet at every station and made a note of this information for you. Ticket Office opening hours were greatly reduced in 2011. We've made a note of what times the ticket office is open and on what days at every station, and also made a note of how many (and what type) of ticket machines there are at each station. And once you’re at your destination station – where next? Again, we’ve checked every station to see what local buses call outside (or nearby) or if there is a Cycle Hire docking station nearby, and where it is located. If you're a cyclist maybe you’ll want to ride to a Tube station and lock your bike up there – we’ll tell you if there’s a cycle rack at that station or not. And what about the river? 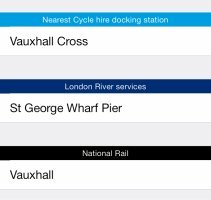 Some stations have links with Thames River services – it’s all in the App. The London Underground is the oldest (the world’s first) Underground passenger railway with plenty of history, art and other interesting things to see. Station Master tells you at each station of things to look out for whilst on your travels! And just for fun on the maps, we added in a couple of things. Everytime there's a busker spot somewhere on the Tube system, we've drawn that in - and we've also started to put into the maps the location of the Art on the Underground's 'Labyrinth' pieces of art, which are sometimes not in obvious locations to find! Where we do find them hidden away, we've marked them on the 3D maps.